Alice (Mia Wasikowska) returns to Underland to fulfill her destiny and face off against the Jabberwocky. "Alice in Wonderland," or should we say "Alice in Underland," is Tim Burton's re-imagining and somewhat sequel to the classic Lewis Carroll tale. The story starts with a much older Alice than in the cartoon version and the book, this time played by Mia Wasikowska, who has lived her life believing her adventures in Wonderland, or as Burton calls it Underland, were all simply a reoccurring dream. Once again, she follows a white rabbit down a hole, leading her to Underland. Once there, she meets a bunch of the characters from the original stories, like DoorMouse, voiced by Barbara Windsor, Tweedledee and Tweedledum, voiced by Matt Lucas, Dodo, voiced by Michael Gough, and the White Rabbit, voiced by Michael Sheen. Shortly thereafter, Alice runs into the Caterpillar, voiced by the fabulous, incomparable Alan Rickman, the saving grace of this film. These characters tell her of a prophecy about Alice acting as champion for the White Queen, played by Anne Hathaway, as she faces off against the Jabberwocky, voiced by Christopher Lee, to ultimately remove the Red Queen, or in actuality the Queen of Hearts, played by Helena Bonham Carter, from power to restore the kingdom to its rightful place. Quite a mouthful, ain't it? Once the exposition of Alice's quest is laid out for the audience, which takes about 5 minutes, now, for the remaining 1 hour and 43 minutes of the film, we just have to sit back and watch her come to terms with her destiny as she makes her way through the goofy world of Underland. She, of course, also meets some of the other classic characters like the Cheshire Cat, voiced very well by Stephen Frye, and the Mad Hatter, played by Burton's go-to and favorite Johnny Depp. Look, we really have liked Johnny Depp in the past. He is not a bad actor by any stretch of the imagination, but his Mad Hatter is absolutely ludicrous. This boasts a ridiculous interpretation of the Hatter, and Depp's part is much too large for the movie. There is really no reason for a character like the Mad Hatter to have such an integral part of this story, but since it's Tim Burton's movie, heeeeeeeeeeeereee's Johnny! Depp as the Hatter is one of his worst roles. Annoying doesn't begin to cut it. From his incessant voice changing to his over-the-top mannerisms, we really disliked his portrayal of the character. Now, not all the blame falls on Depp. 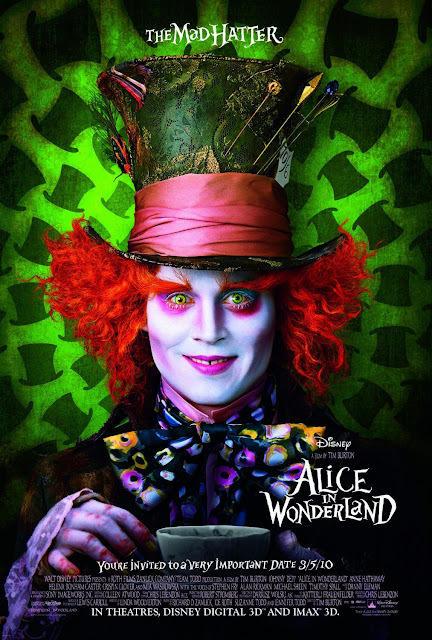 We are big Tim Burton fans, but we're not exactly sure how much of this portrayal of the Mad Hatter comes from Depp's acting and how much of it was Tim Burton's direction. There is such a thing as scaling it back, Timmy Boy! Depp isn't the only one with a larger than life, in the way style. Helena Bonham Carter isn't much better as the Queen of Hearts, who has been combined with the Red Queen to make one large-headed yelling-box of a character. It's all just too damn much. When we heard Burton was going to direct "Alice in Wonderland," we were excited. We thought he could provide us with visual-filled spectacle and his signature twisted style and take on a classic tale such as this. Instead of going for a more positive experience, instead, Burton seemed content on widening the hole of hatred many have for him. This film is a huge, huge miss for us. For the most part, it is flat out boring, despite its overabundance of colors, sights, and creatures. The fantastical visual spectacle of Wonderland/Underland is reduced to nothing more than an overblown, tedious, childish CGI-fest. In a realm such as Wonderland, which is supposed to have a dreamlike quality to it, the visuals go the opposite way, favoring a cartoonish nature as opposed to something fun, or whimsical, or even interesting. Burton sacrifices a cohesive, well thought out story for a sea of mediocre, mildly dated visuals as we are forced to watch Alice spin her wheels, killing time until the inevitable showdown with the Jabberwocky. "Alice in Wonderland" was such an unexpectedly huge financial success that it is now getting a sequel this year. To us, this film serves as a career low for Burton, keeping in mind we have not seen "Dark Shadows,"....yet. It's all too artificial, too distracting, and too messy to make us ever want to watch it again. Oh no! I thought it was fun. Kinda of like eating a whole bag of chips in one sitting. Totally not sustaining but mindless enjoyment at any rate. I am not very familiar with the Through The Looking Glass Story but I got excited about the preview. I think I need to go read the book though. Dark Shadows... that was rough. I have to say, the trailer for Through the Looking Glass looks about the same content wise, but that Pink cover song of "White Rabbit" is AMAZING! That's one trailer I'm not sick of, despite seeing it over 10 times this year. Dark Shadows....now that's one I'm not looking forward to. I've heard horror stories about it. But, Miss "Peregrine's Home for Peculiar Children" looks awesome! !